Not Rock Hill's first church but one of its most historic. 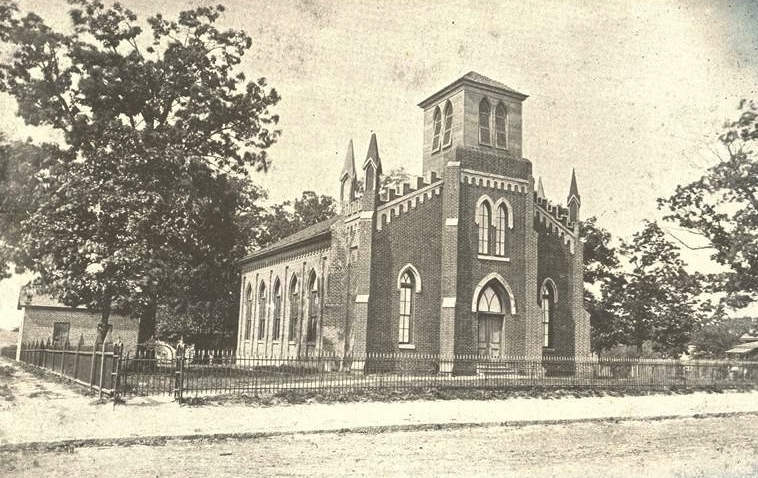 Image of the original First Presbyterian Church building to be constructed on his corner. Image of the current church shortly after construction. Note the bell tower was shortened, following a massive tornado, which damaged the tower in 1925. In the 1850’s, the area that became the village of Rock Hill was originally within the bounds of Ebenezer Presbyterian Church. As the population grew, an effort was needed to provide a place of worship for members who lived in the southern part of the parish. The Ebenezer Session gave permission in 1854 to build the Antioch chapel three miles south of Rock Hill, but this building was moved to a more central location in 1858, by way of logs and mules. The new lot, on Main Street, was purchased from A.T. Black, with the deed stating that, should the location ever be used as anything other than a place of worship by the church, the property would revert to the heirs of the Black family. In 1859, 52 members of Ebenezer Presbyterian petitioned to organize a new congregation. A new brick building was built in 1875, the old chapel having been sold and used as a school. A full-time pastor, Rev. William Beatty Jennings, was called to serve in 1883. The growing congregation soon required a new sanctuary, and prominent architect Charles Coker Wilson was hired. The new building was finished in 1895, and reflected an eclectic mixture of Late Victorian design elements. In 1905, the first pipe organ in Rock Hill was installed in the church by local builder and architect Julian Starr. By 1910, it was the largest Presbyterian congregation in South Carolina. More building work was done in the 1920s, including and education building in 1922, and a new bell tower in 1926, following a massive tornado in downtown Rock Hill, which had destroyed the original steeple.